My hair horns are at an all time high lately. I lost a good amount of hair after having Skye and it is now growing back and wanting to show off it’s growth to everyone I come across. Andrew has had 6 night shifts (6 pm- 6 am plus an hour commute each way) in the last 8 days. We have all missed him a lot (and he wrote a pretty funny post about his experience that will go up tomorrow) but Brooke has loved sleeping in bed with me while he is gone. I do not know how Andrew/people do the night shift… once 9 pm hits I am a full on zombie. 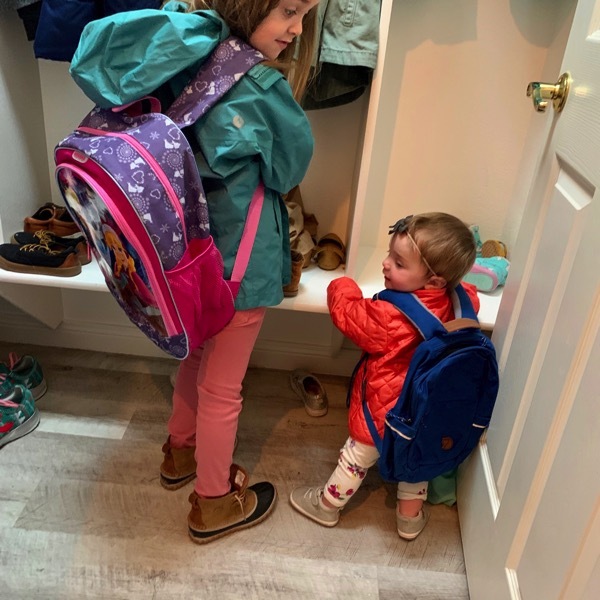 I think Skye is ready to leave me and join the big kids at school each day. 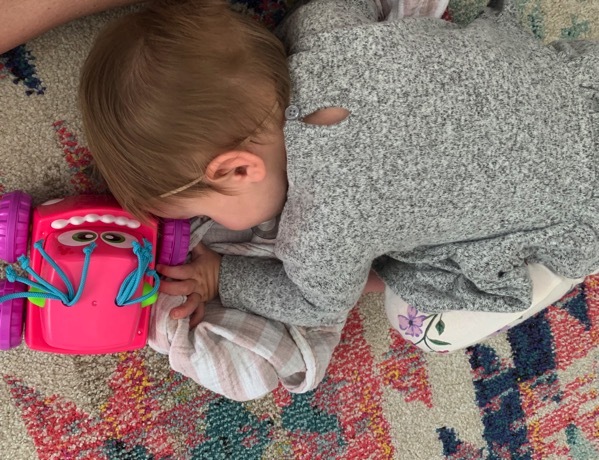 Signs Skye is ready for a nap= she starts playing with her toys while laying down on the ground with her binky and blanket. A lot of you recommended Running Your First Ultra by Krissy Moehl for tips and a plan for us for our 50 miler. This book is so good, I’ve been devouring it at night and have learned so much already. Andrew loves the plan too so we are starting in at week 7 to get through it in time for our race. Both of us have a good enough base to start from here so we are excited to have a plan now. We have to mix days up some weeks and some days I’ll probably stick to just doing what my body feels like that day but overall it works great. Yesterday I did the speed workout from the plan. I have realized I have motivation to do speed when my only option is the treadmill but zero motivation to do it outside right now. c/d until I hit 9 miles. The thing about the treadmill that frustrates me is the fact that I want EXACT answers of how comparable the speeds/incline are to running outside. I want to know exactly how a 6:31 pace at a .5% incline compares to outside. I have to remind myself that I can’t control everything (my biggest struggle in life ha;) and that if the effort is there and I’m really working hard, then the workout has gone perfectly and the fitness has been gained. The first two repeats were the hardest… like every speed workout for me. Once I got into the 3rd one my body was in a groove and maybe the fact that I started lying and telling myself that I felt comfortable made the rest all feel more doable. We both guzzled our liquids afterwards. Sweaty hair horns= even more thrilling. Once Andrew woke up we went for a late lunch together with Skye! And the best hot chocolate there is… I think half the cup is cream, it is so thick and rich. Have I ever told you how good Brooke is at impersonating dogs? 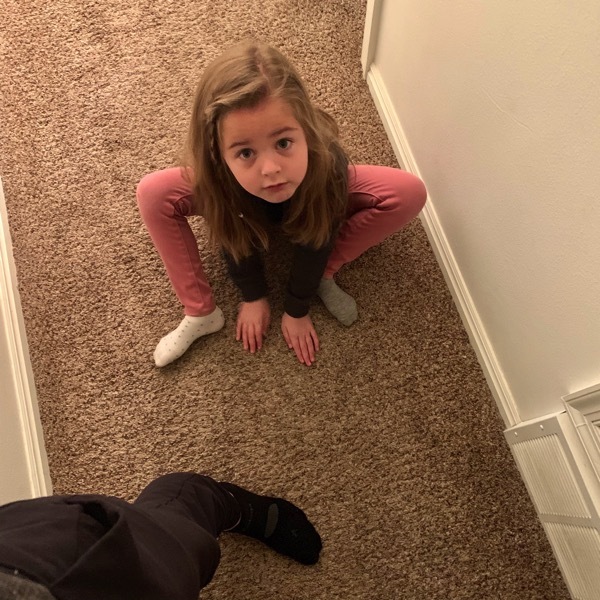 She started doing this when she was three and has become quite skilled at it. She scratches her ear with her foot, she can go just as fast as Beretta around the house on all fours and she will go down the stairs face first just like a dog. I kind of love it when she follows me around just like a puppy would and barks at me if I call her Brooke on accident and not Crystal (the name of my poodle from when I was younger). Skye was bored that Brooke had to do homework and just laid there waiting for her. And then the girls did not want him to leave. 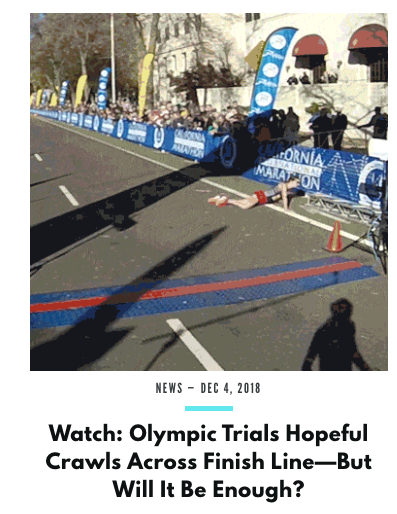 Did you see this story of how Hayley Sutter fell right before the finish line of CIM (she is okay!)? 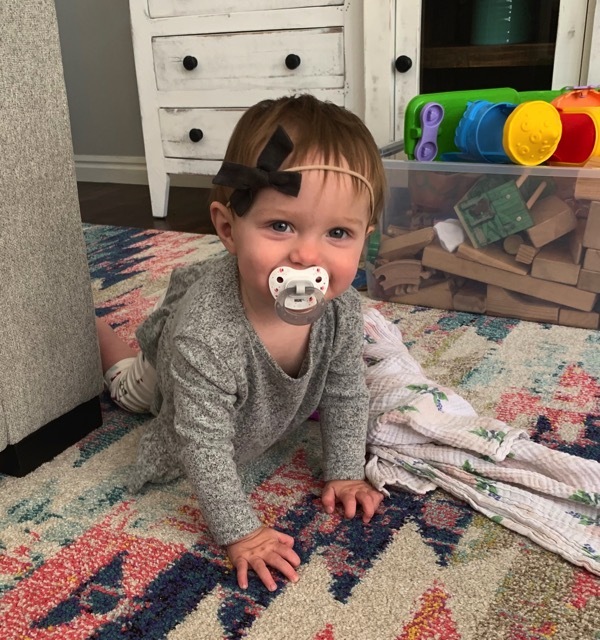 She crawled over the finish line… talk about determination! Her gun time was 2:45:07 but her chip time was 2:45:00. 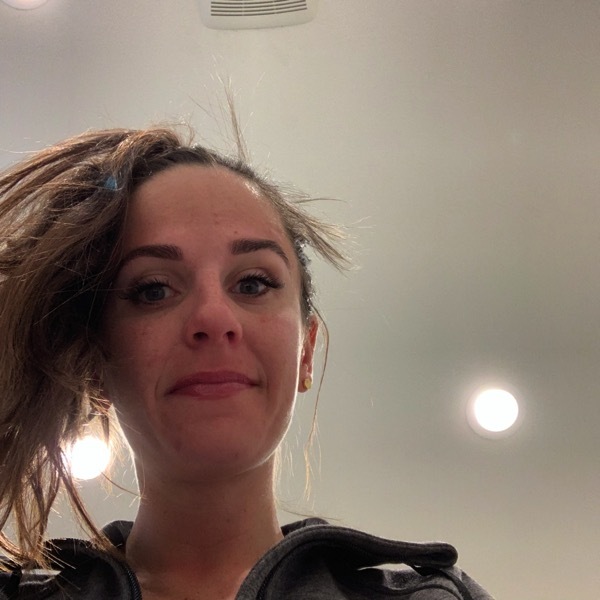 For the trials qualifiers they usually only go off of gun time to go to the trials but hopefully they will go off of her chip time or better yet… She is able to run another marathon before the trials and PRs again (her previous time was 2:52)! The whole story is here. Alicia’s comment last week had me thinking… isn’t it funny how different our perspectives are on food and the way to eat them. Like how to eat a grapefruit or Kit Kat bar (like we talked about with how Des Linden eats her Kit Kat)? I would LOVE to hear any of the things that you think are funny to see others do with their food! -Andrew thinks it is beyond weird that I dip my chicken nuggets in ketchup. -If somebody bites into a string cheese. 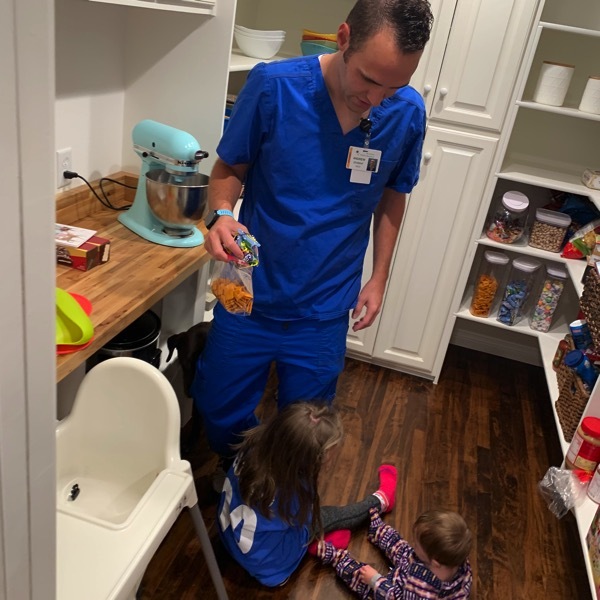 One of the doctors that Andrew recently worked with had three string cheeses and bit into all three at once. -People think ranch and pineapple on pizza are weird but we love it. -Nuts in brownies is just wrong. -WHY IN THE WORLD WOULD PEOPLE MESS UP A BEAUTIFUL SANDWICH WITH OLIVES? -Knox and Andrew both bite directly into a sucker and Brooke and I take 3 hours to eat one. Treadmill or running outside—> Which one feels harder/easier? Following a training plan right now or doing your own thing? What is your run/workout today? Sometimes I Wonder How + Tuesday Tangents. My mom saved the day and running just does something for me. Off to California, Friday Favorites and YOUR Running Accomplishments! 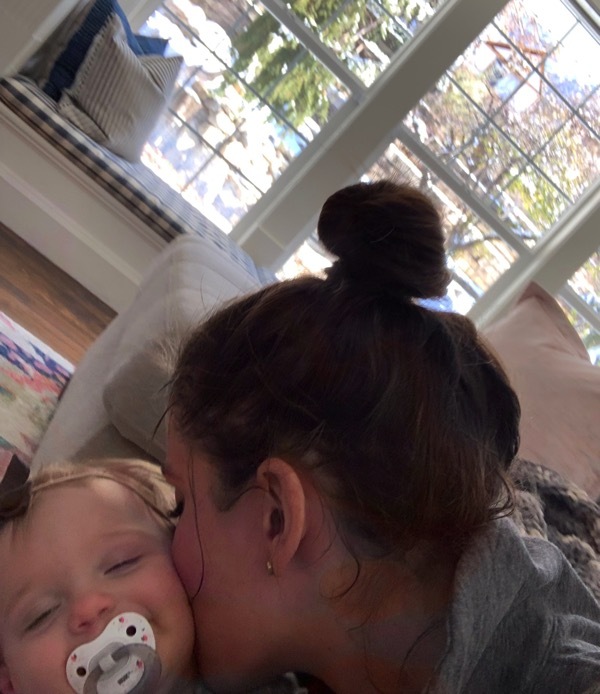 What are your thoughts on this running question and three things I need to tell you about Brooke lately! Haha my husband loves crispy cookies but I always bake them soft and this has probably been the subject of most fights in our marriage. I have always gotten serious hair horns, I think it’s because I have wavy-ish hair. I don’t know how you handle that with him;) At least that means you get any soft cookies that come your way and you don’t have to share! Hair horns club unite. I hope you are having a wonderful day Victoria and I’ve been meaning to ask you, are you on the trainer for your bike more during the winter? Props to you for doing that speed workout on the treadmill! I definitely have to give myself mental pep talks when I’m on the treadmill. The same amount of time/distance outside feels so much shorter! I get confused when people bit straight into popsicles. First of all, that’s WAY too cold for my teeth. And, second, you don’t get to enjoy it for as long if you just chomp away at it instead of savoring every morsel. It makes no sense to me. Oh I totally agree with you on the Popsicle. I don’t think I’ve ever bitten into one. And yes about outside running feels like it zooms by. Have a great day Natalie! My whole family thinks the way I eat my pizza is wrong: I eat the toppings & cheese off first, then sprinkle parmesan cheese on the crust & eat it. My husband drives me crazy when we eat biscuits. Instead of drizzling honey on the whole thing and eating it like a normal person, he has to hold the honey and squeeze a bit onto each bite. Treadmill feels way harder, almost every time. Hahaha I might be on your family’s side on this one;) AND I agree with you on your husband’s biscuit eating methods! Yes and yes about the treadmill. Have a wonderful day and I need to start shipping any olives that come my way to you. I WANT A KNEADERS!!!!! Amazing desserts and now hot chocolate?! You are so lucky. Okay, weird food habits. I ALWAYS eat the cheese and sauce off of my pizza with a fork and then I pick u p and eat the crust and dough part. My daughters ask me why I eat it that way–ha ha I think it’s b/c the dough/crust is my favorite part, and I don’t want it to be ruined with the cheese and sauce! I agree–NO NUTS in brownies or any baked goods!!!!!! And, I am with Andrew on the chewy underbaked cookies. I was drooling over your pic of those underbaked rolls the other day! DOUGH! I am off running today and am meeting a friend to try a new hot yoga class :) I am SO HAPPY to be off. My run was ROUGH yesterday. Just 6 easy miles, but I had gone to 5 am strength class and hadn’t really eaten enough through the day (lesson learned), so my legs were heavy, and I would have given my right arm for a gel or any kind of food/calories!!! I was on an out and back trail–not even a Seven 11 to pop into!!!!! :) My legs will enjoy this day off from running! Have a beautiful day, Janae!!! 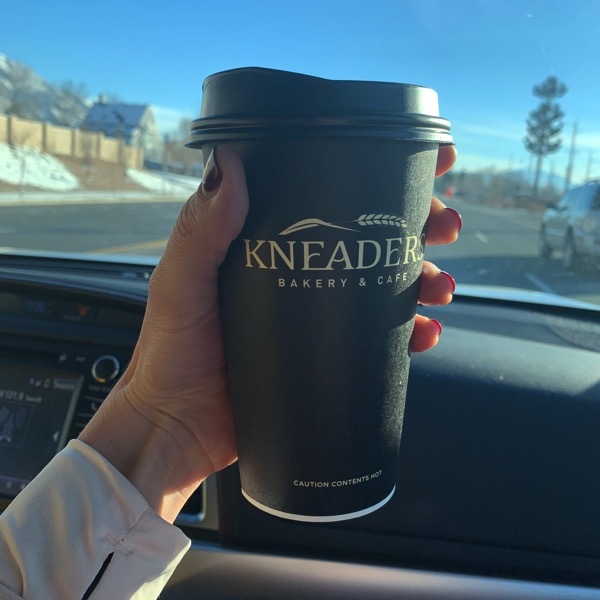 You need a Kneaders… their french toast will make you pack up your family and move here;) REALLY….Kelly below eats hers kind of like that. Hahaha! VERY smart to take today off! I’ve learned my lesson with that situation before too and it’s no bueno… each step is SO hard. Thank you, you too! I don’t like soggy cereal, in fact I push my cereal all to one side of the bowl to keep it OUT of the milk as long as possible. And agree with Natalie about people biting into popsicles – even the idea of doing that makes me shiver a little. Treadmill runs are so much harder because they are so boring! I think I also dislike the fact that you can’t feel the air moving past you as you run if that makes sense…stagnant air + running just feels wrong mentally. Even on the types with fans it doesn’t replicate the feeling. OH I LOVE SOGGY CEREAL:) I’ll take yours haha. I sweat 10 times more on the treadmill than I do outside because of the lack of air. I think that is super smart to do treadmill hill workouts in your circumstance… any chance your treadmill goes downhill? If not, prop up the back a bit so that you can get some downhill miles in before you go up to really prepare for it. You are going to do amazing… I am thrilled for you! As for training plans–with 2019 being my year of 10ks and knowing that I have a crazy work schedule and fitness-class-teaching schedule, I needed to schedule everything out–at least for this first 10K in January. So in scheduling everything out on a nice printed-out piece of paper, I guess I wound up making for myself a loose training plan. 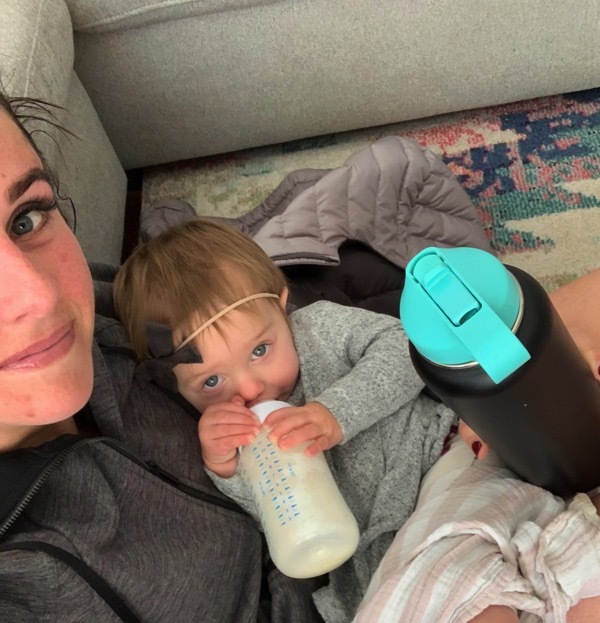 Because I am nowhere near a place to even think about “how can I get faster?” since I am still thinking “I want to feel good and pain-free,” my emphasis is on training for miles instead of training for paces. I’m totally OK with that. I just want to make sure that I move safely and that I learn how to juggle the ebbs and flows of arthritis flare ups/my energy given my work load/feeling OK with the fluctuations in my weight from stress and other life things/emphasize the JOY I feel when I am out there running. Right now that’s top priority. This will not always be my priority. 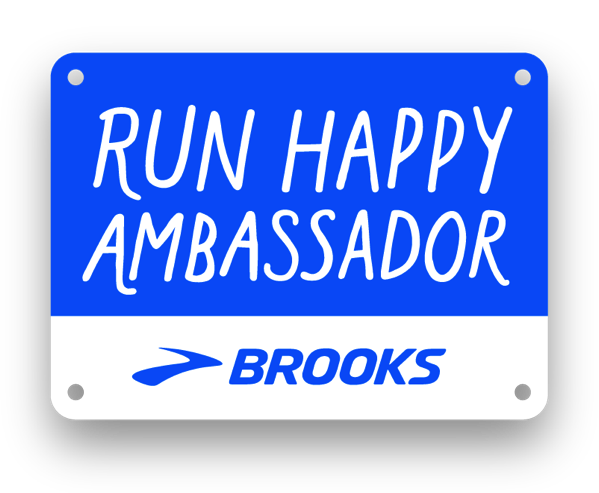 And that’s OK.
That’s the HUGE lesson that 2018’s year of 5ks taught me: the priority I have right now, and the way I feel right now, and championing what I CAN do instead of admonishing myself for what I used to be able to do–it’s enough, it’s beautiful exactly as it is, it’s worth celebrating. Brooke needs to teach me how to scratch my ear with my foot. Somehow, I haven’t learned that trick yet with all of the yoga and Les Mills Body Flow! BUT BRINNER IS THE ABSOLUTE BEST:) Okay, have you tried pizza dipped into ranch? I think you need to! You are doing amazing with your training and how much stuff you have going on in life. So excited to see what is in store for your 2019! Have a wonderful day, Stephanie! Brinner IS the absolute best! ODDLY ENOUGH I didn’t know Tom’s aversion to brinner the first time I cooked for him. We were in a textversation right when we started dating and I had asked him “are you up to anything good?” And he said he was going out to have a drink at the bar and read from his book and then grab dinner somewhere, and I said “why don’t you come over? I’m not making anything special, but I’m always happy to share.” I had not known at that point what he liked and didn’t like to eat and about his belief that eggs don’t make dinner…and on deck for dinner that night was an egg, spinach, and gouda scramble!!! I only realized a handful of months later when ‘dating’ had long since become ‘a relationship’ and we had told each other we loved each other and his job turned “a few miles apart” into “a long distance relationship” about his aversion to brinner. I realized, in retrospect, just how much he REALLY REALLY REALLY must have liked me from the get-go! Hahaha you really are normally an openminded person but I see how you can draw the line with this. Amanda, I hope you have an awesome day! Nuts don’t have any place in desserts. And soft cookies are always better inless it’s pre packaged like Oreo or chips ahoy. Those can be crispy. I realize this makes me seem like desserts are my life. They aren’t everything but they are a big thing hahaha! Running on the treadmill always seems way harder, especially after being able to run outside for so long. No workout for me today. But I’m planning to run tomorrow. I eat all candies layer by layer (think snickers, kit kats, twix, reese’s pb cups). First I eat the chocolate off, then each of the layers. My husband thinks I’m a total weirdo. I even do it with candy corn! First the white tip, then the yellow, then the orange. I love your salad pictures – I wish we had a great salad place near me. Or maybe we do, and I just haven’t found it… OR I wish I had a personal fully-stocked (by someone else) salad bar in my house! Treadmill always feels harder to me. I am experimenting with distraction techniques now that I have two kiddos & it is even tougher to get outside for runs. We finally got our treadmill setup post-move – those things are heavy! Took my two brothers & my husband + some fancy moving straps to get it inside & downstairs. I can’t wait for the hair horns! (still losing) And crispy cookies = ice cream topping only! Is Brook still taking riding lessons? Haven’t seen any updates and just wondering. I’m a rider and my daughter is too and she started age 7 (she’s now 31). That is SO cool that you and your daughter ride! We took a break from riding lessons because we moved and her last place is now really far so we are on the waiting list for the place right by us. She is dying to get back! Have a wonderful day! I am still building my base while rehabbing my stubborn IT Band… but I will start my training plan next week! Today is a cross-training day.. spin bike + weights. Sometimes I feel like running outside and running on the treadmill are two completely different sports. If it wasn’t for dark and cold I’d run outside all the time. Overall running on the treadmill is harder but I’m also faster there. There’s no big red stop button outside. And no snow or ice on the treadmill. Nature outside and Netflix inside. It is harder for me on the treadmill, for sure. Mentally I start to lose it about 4 miles in (and that’s with Netflix and intervals) and my new treadmill makes my legs hurt more than outside, too (I know, that’s weird and doesn’t make sense but it does). No training plan right now, just my own thing. I did my 30 mile trail run in May and half marathon PR in August and feel like full recovery/feel normal/no niggling aches didn’t happen until around Thanksgiving. But I will probably do a fun 10 mile in January and fun (no PR) half marathon in February so an official training plan may be around the corner. Night shifts were really hard for me. I loved the “culture” of the night shift, but once 3am hit, I was so… tired. I can’t imagine doing one, and then driving an hour home. That sounds dreadful. Please tell Andrew to stay safe while driving! My little guy lays down while playing if he is tired, too. It’s so stinkin’ cute. I find treadmill runs to be the most difficult mentally, but easiest physically. I can’t do incline, though. There’s something about running up a hill when I can’t see the hill in the distance (like on a treadmill)… it messes up my equilibrium, and hurts my Achilles tendons. I save incline for outside. I’m not training for anything, and haven’t been for quite some time due to health issues, being insanely busy, and then having my son. As it is, I get up at 4 to run before he gets up, and I just can’t get up even earlier for a long run. I believe that everything has its season, though, and I will get back to training in time. In the meantime, I’m really enjoying plugging in a podcast and plodding out a few miles at a time. This is so funny, my friend and I were just talking about weird food preferences! I love eating chocolate bars straight out of the freezer, I will not eat them at room temperature. Same with cookies. As soon I they bake/cool I immediately put them in the freezer! (sadly this means I have to wait like an hour to eat them; I have got really good at planning ahead so I always have nicely frozen cookies available). Currently outside is wayyyy harder, nye impossible. There is a permanent layer of snow/ice here in Calgary, so I am embracing the indoors! Also, your salad pic is makes me miss Kneaders SO much (I moved from Salt Lake back up to Canada a few years ago). Turkey avocado bacon for life! Hmmm…I’m feeling a little weird for preferring crunchy cookies. I like crunchy food in general. I don’t eat salad dressing or boxed cereal with milk because I HATE soggy food. TM running is harder, but like being able to zone out or people watch at the gym. I’m still working with my coach, but I’m finished racing for 2018. We’re getting ready to talk about my Jan/Feb races and get serious about training for those. My workout today is an easy run and weights at the gym. 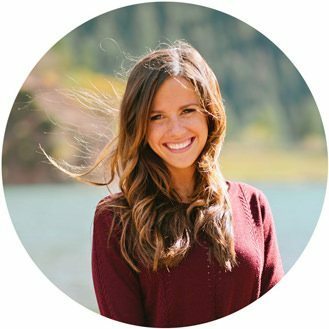 Love that article about Hayley Sutter…it brought tears to my eyes!! The part about asking the guy to help her **all the feels**. Runners are AWESOME! If eating chicken nuggets with ketchup is wrong, I don’t want to be right. My weird food quirks- I like dipping cheese in apple. My two year old asks for cheese with her apple sauce, so that’s a success. I also love pineapple on pizza, though I vehemently disagree on nuts in brownies. 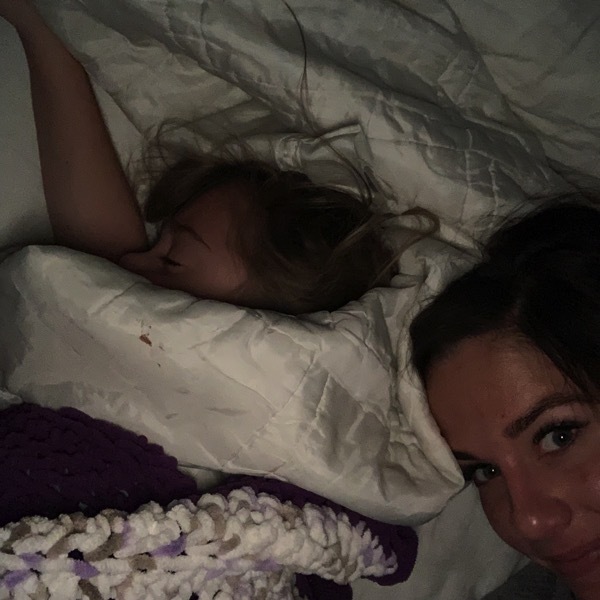 My run- six easy miles (cross my fingers) during my sick kiddo’s nap. No speed as planned after a night up with the little one. Crispy cookies are the worst! But I do love pineapple and ranch on my pizza too. Running on the treadmill is definitely mentally harder for me. A lot of times I have to picture myself on a route to finish a treadmill run. I am currently not doing any plan. I was trying to build up a base for my half marathon training that will start in January but my cold will just not go away so anything over 4 miles makes my lungs feel like they might explode. Hopefully I can get back to more mileage in another week or two. We have a neighborhood bet for this half marathon so I need to get back to my speed workouts. Night shift is why all the computer chairs are tilted back like a recliner every morning. 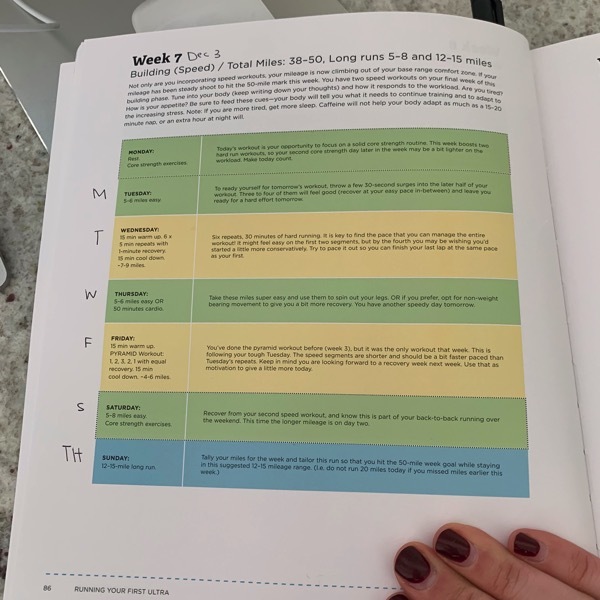 I’m doing my own thing … one long (to me) run on and one speed work each week, and depending how busy I am a bonus workout is cross training – either my spin bike or a swim. 2 runs per week is my sweet spot, as if I go more than 2 days per week I start to dread it. Some weeks I do no workout or just one because weeks when I am on call for work I am on 24/7 so I just do what I can and not worry about it!! Today was a speed workout on my treadmill I got for my bday!! Loving having one so so much; it is so convenient and I’m enjoying it much more than having to go out in the freezing cold and pitch black at 6 am!! Have a great day, can’t wait to read Andrews funny post. haha my husband thinks I’m crazy for dunking my chicken tenders/nuggets in ketchup when he loves the chick fil a sauce so much! Ketchup is my choice in dipping sauce for fries too, no aioli or anything else for me. Funny story, when we went to Australia, we grabbed food in the airport and one of the workers handed us our food and then handed us a bunch of ketchup packets saying I know how you Americans love ketchup… I guess we couldn’t deny that stereotype! I definitely don’t like olives on anything, nuts in baked goods, fruitcake just seems weird, and I also don’t like cheese. Slightly undercooked cookies and brownies are amazing! I’m going to try and run a few miles with my dog today. I’m still recovering with some PF issues after my baby 6 months ago! I ran the turkey trot and that was the longest run i’ve done in a long while. I stopped running at 31 weeks. It was also the slowest run ever. I don’t think I’ve ran this slow since I started running my freshman year of high school! Boy do I have some work ahead of me… it’s very humbling. Running on the treadmill is always so much harder for me because it’s a mental game. All I want to do is stop and go lay on the floor, so in a way it’s even more exhausting than a longer run outside. Today I have a two mile tread mill run and I’m dreading it…which is why I refer to it as the dreadmill. Not following a plan now; I ran the RNR Las Vegas half and got a 15 minute PR so I’ve taken a few weeks off, but it’s time to get ready for my next race next fall. I love ice cream on its own, but I don’t like my desserts ala mode (the ice cream interferes with the chocolaty or fruity goodness) and I’m not a fan of pulp in my juice. I do love pineapple and ranch on pizza, and I LOVE olives, especially kalamata and green spanish olives. Kudos to Andrew for getting through those night shifts. I’m with you, I’m a zombie after 9pm. There is a website I use to check treadmill speed to outside – https://42.195km.net/e/treadsim/. I hope this helps – I also use it to see how calories burned since I am not exactly 100 pounds! Since we have an early winter, I prefer treadmill. This summer, I preferred being outside, so I guess I am a fair weather running person! I LOVE olives as well – black are my favorite!! But not on a sandwich. Pizza or just alone! I feel for anyone working the night shift, it is not easy! Treadmill = worst thing ever. Maybe I’ll come around to it one day but right now I despise it. Okay, speaking of making up your own training plan… I did about 12 miles today (only ran about 80%, took frequent walk breaks)… I’ve realized that my only hope of doing the marathon at this point is going back to heel striking. My soleus muscle on both sides feels like it’s tied in a knot when I try to land midfoot. I think they might be overstretched rather than tight. But when I run heel striking, it feels better on my calves, my shins aren’t hurting, and I’m able to go at the pace I want. Can I keep that up for 26.2 miles?… Definitely not sure, but I think there’s still a chance. This whole lower leg catastrophe has been so frustrating, it makes me feel like I don’t even know how to run. And 3 weeks ago I thought I was all set for the best marathon ever. Ranch on pizza is gross to me. My roommate does that. He also eats, every morning, a fried egg on top of a bowl of oatmeal? Not gross to me, but kinda weird. The thing I do that’s weird is devour grapefruits like a savage… I cut them in half then just attack each half with my mouth, standing over the sink hahaha. Grapefruits are my favorite fruit when they’re good. I’m running a marathon on Saturday and the weather prediction looks bad. 100%rain and wind. I can maybe handle rain but am wimpy about wind. You are so positive a person – help me think of a positive mindset! MARY!!! I am so so sorry about the weather prediction. Remember, there is still time for it to change though! This happened for St. George where the weather predicted was terrible but then on race day it was actually perfect. 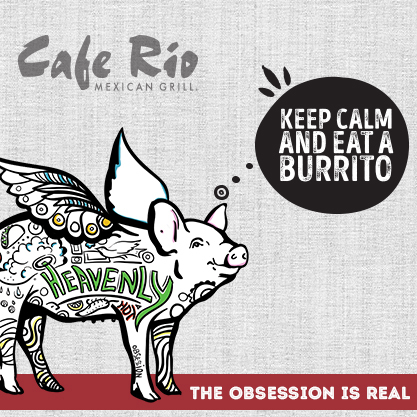 Either way… it’s out of our control. YOU CAN do hard things. You’ve trained for this. You are going to fight for each mile and the best part of all… WE GET TO DO THIS. There are still plenty of people that have amazing races in the rain and wind… why? Because of their brains. They think positive about their abilities and their strength and they go for it. Repeat to yourself, “I can and I WILL.” I am a strong believer in self-fulfilling prophesies… whatever you tell yourself is going to happen on Saturday will. So start now to smile every time you think of the race and tell yourself you are going to have a great day. I’m cheering for you! Thank you so much for your kind and encouraging words. I knew you’d make me feel good and you did! I got this! 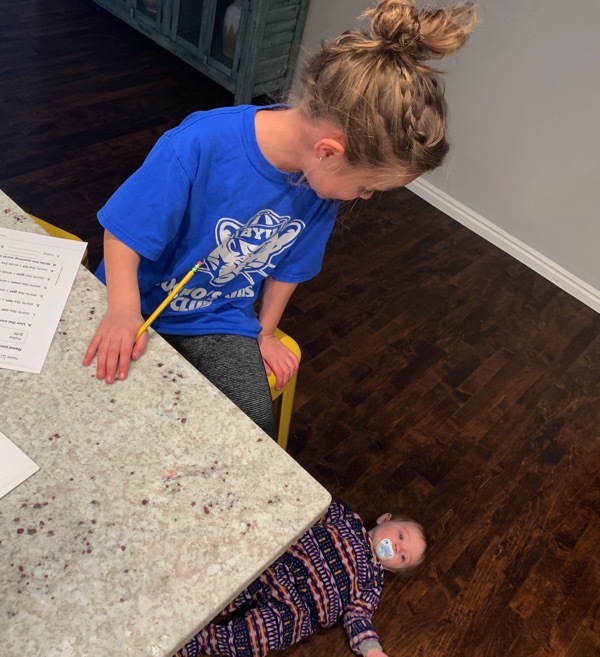 The picture of Brooke doing her homework (with Skye on the ground) reminded me of Curly! She’s getting so grown up! 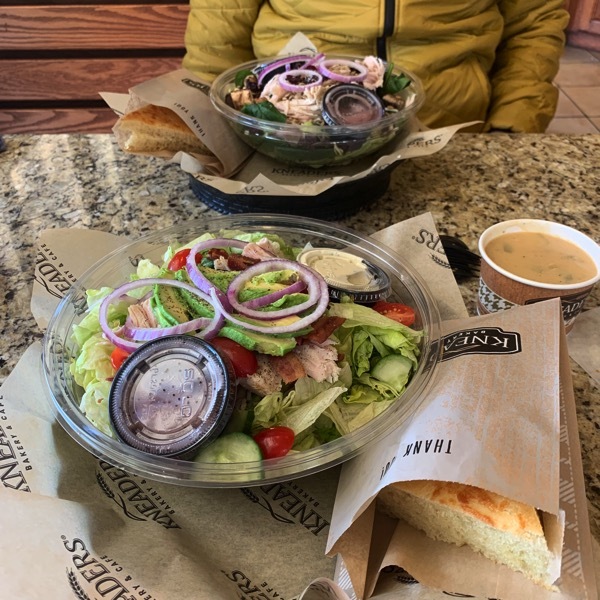 My first thought when I saw the picture of your salads was “how can they ruin them with those onions?” I’ll trade you my onions for your olives, k? I always run outside. What feels harder to me is completely flat vs rolling hills! You should roll a half marathon race into your training for the 50mi… think you would def PR! Just getting caught up– been gone for a while. Super stoked to see your progress and how you tackle the ultra! Okay I tried to comment this and for some reason it didn’t go through?? Sorry if duplicate! You should roll a half marathon into your 50mi training.. think you’d def PR with these workouts and the marathon behind you! Been gone for a while and just catching up… Stoked to see how you do with the ultra!! It’s so good to hear from you… I think that is an EXCELLENT IDEA. Thank you! How are you doing?! I was just talking to a running friend about how it’s funny that we all have certain things that we do a certain way. For instance, he said that all of our local running groups run on our bike trail but that we all meet in different places and run in different directions. Running outside with friends is always easier, but speed on the treadmill is easier. I have to think less and I can’t slow down as easily. I have a marathon in May, so this is definitely my off season so I’m just running for fun right now and cross training. Today was 6 miles with friends and rain. hahah that is awesome!!! Pregnancy/birth do some weird things to us;) Hope you are having a great night! I agree with you, olives are totally the worst. The green especially. Isn’t it weird how olive oil tastes perfectly fine though? – I cant agree enough with the olive comment. SO MANY SANDWICHES RUINED BY OLIVES. SARA!!! HUGE congrats on a 15 minute PR… WOW. That is amazing and that sub 3 is yours next time! NO NUTS IN BROWNIES EVER! also my mom loves fruitcake, too?!? !